12 packs of 200 C-fold towels. Recycled from 100% pre- and post-consumer material. Deeply embossed for thickness and more preferable feel. 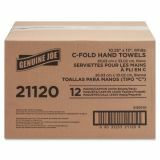 Folded towels encourage faster washroom traffic and cleaner restrooms. 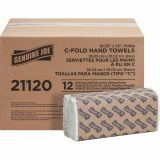 Genuine Joe C-Fold Paper Towels, 10.10" x 13", White, 200 sheets, 12 packs/carton - C-Fold towels offer a larger towel size and one-ply construction which increases the absorbency of each sheet. Deeply embossed for thickness and more preferable feel. 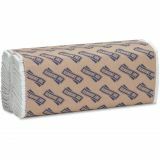 Folded towels encourage faster washroom traffic and cleaner restrooms. Hands-free dispensing is more sanitary and prevents cross-contamination. Ideal for public environments. 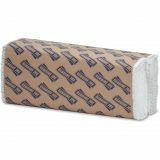 Made from 100 percent recycled material with 40 percent post-consumer material.